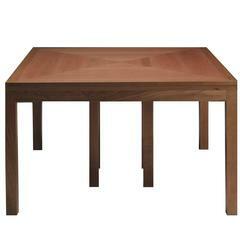 This imposing table will make a statement both in a Classic and contemporary decor. The frame and top are made in wood, showing the natural veins that make each piece a one-of-a-kind design object, and create a magnificent canopy above. The wood can be Italian walnut, American dark walnut, cherry, maple, durmast oak, or durmast oak with a wenge color. The table is supported at the center with a column in pink Portugal marble that adds a striking contrasting element to the piece. 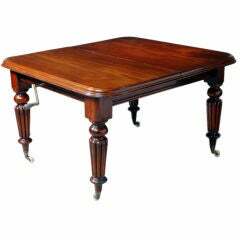 Mahogany dining table with Regency-style reed legs on casters. 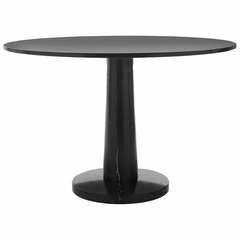 Handle extends table for extra leaves. Closed: 29.5" H x 45" W x 48" D. Two leaves: 17" W each. 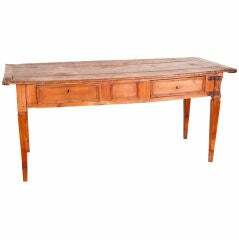 Gorgeous writing desk or kitchen table with original hardware. This generously sized solid oak table has beautiful graining and weight. The simple trestle base has a gentle curve with minimal adornment. Measures: 11".